This particular pressure cooker is made to be used on all heat sources instead of being plugged into the wall. Because of this, it more closely resembles a stainless steel pot, providing the cooker with a sleek look. It is constructed out of 18/10 stainless steel, which offers long-lasting durability and a high-quality, professional appearance. An impact bonded diffuser base allows for even heat distribution. The one thing that gives the pressure cooker away is its handle, which stays cool and locks securely in place. It contains a triple safety feature with a dual pressure control valve and two independent pressure release valves. It also contains a visual pressure indicator, so you know exactly when the pressure has been released and it’s safe to open the cooker. The handle is UL approved. Not only does the Fagor Duo 8-Quart Stainless-Steel Pressure Cooker make cooking healthy meals easy, it makes serving them up easy as well. It comes with a handy steamer basket with convenient legs and a handle, which also makes draining pasta or steaming vegetables a breeze. The pressure cooker is able to reduce cooking time by 70 percent, which also means saving 70 percent on the energy needed to cook the meal if you were to use traditional methods. Two pressure settings are available, and this particular model comes with instructions, as well as recipes. Because the Fagor Duo pressure cooker works on the stove and other heat sources, instead of needing to be plugged into the wall, it is dishwasher safe. This particular model is quite affordable (see lowe﻿﻿st price). However, smaller and larger models than the 8-quart size are available, depending on your needs and your budget. Unfortunately, it’s all too easy to swing through the drive-thru on your way home when you know you don’t have a lot of time or energy to cook. For some, the hassle of dealing with a clunky electric pressure cooker is too much to take, especially when cleaning up isn’t easy. The Fagor Duo 8-Quart Stainless-Steel Pressure Cooker with Steamer Basket simplifies pressure cooking with a streamlined, stainless steel design that is dishwasher safe. You won’t mind cooking with it in the evening, no matter how tired you are, because it’s so simple! When I say that this pressure cooker can cook food fast, I really mean it. Cook a delicious risotto in just 7 minutes, meatballs in just 4 minutes, and chicken soup in 15 minutes. You can even enjoy cheesecake in 30 minutes! If you’ve ever made homemade cheesecake before, you know it can take hours before you’re able to enjoy the fruits of your labor. The Fagor Duo pressure cooker can cook food up to 70 percent faster than traditional cooking methods. If you’ve never cooked with a pressure cooker before, I definitely recommend that you start with a recipe from the cookbook. There are a lot of tasty dishes to try. Another great thing about this particular pressure cooker is that it comes with a 10-year warranty. The safety of the handle is also UL approved. It has even appeared on MasterChef and was voted Best Buy in Leading Culinary Magazine, so you know it must be good! If you’re looking for a pressure cooker that skips all the fancy settings, the Fagor Duo 8-Quart Stainless-Steel Pressure Cooker could be for you. 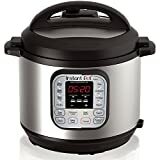 Its streamlined design fits right in with all the other pots and pans in the kitchen, and having only two settings, there’s no need to stress over the endless settings that are standard with other pressure cookers. It’s also a great choice because it can be placed in the dishwasher safely.